Proove Biosciences, Inc., the commercial and research leader in personal pain medicine, is at the forefront of the national discussion for prescription drug abuse. 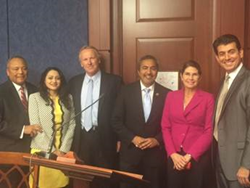 At a Congressional Briefing hosted by the Collaborative for Effective Prescription Opioid Policies (CEPOP), Brian Meshkin, CEO of Proove Biosciences, joined a panel of experts to discuss the prescription drug epidemic. According to Meshkin, it is now possible to identify patients who are most likely to develop an addiction to opioid prescriptions prior to treatment. “By assessing a patient’s brain chemistry along with other related factors, we are able to identify addiction risk levels before drug exposure,” said Meshkin. As a pioneer in precision medicine technology, Proove uses a patented bioinformatics platform that integrates genetic characteristics, electronic health records, and clinical assessments to feed complex algorithms to predict outcomes. With this innovative approach, Proove is able to merge genetic data with related health information to indicate how a patient is expected to respond to opioid prescription drugs. By understanding how a patient might respond to specific drugs before treatment starts, Proove is able to help doctors develop treatment plans that minimize the risk of addiction. “We highlight our predictions on a Proove Profile, which is a tool that empowers physicians to make objective treatment decisions based on each patient’s unique characteristics,” explained Meshkin. To fully address the prescription drug abuse epidemic, however, it is important to offer guidance for patients currently using opioid medication. “The good news is that the Proove Profile extends beyond predicting addiction—it predicts therapeutic effectiveness as well,” continued Meshkin. With a powerful tool for guiding treatment decisions along with an innovative technology platform, Proove Biosciences continues to show its commitment to contributing to the fight against prescription drug abuse.